Beer bikes are trendy. In the past 20 years, there was nothing new to tourism that could inspire the crowd like them. The introduction of beer bikes changed it all. Love it or hate it, they’re everywhere and spreading rapidly in every major city. Because it’s exercise. Pedaling in town with a heavy beer bike, your buddies and several large beer kegs is a though thing to do. Try it to believe it! You can burn a good amount of calories while making your way through town. It has beer in it. Everything is cool with beer, right? Why not combine it with regular cultural activities to create beer sightseeing. Beer bikes are great team building games. Bring your colleagues or friends together to enjoy a cool afternoon with a few pints. It’s just like going to a bar, but with more fun and excitement. Don’t do the usual thing, make things interesting for a change! Sightseeing is included. Our beer bikes in Budapest run in the amazing historic city center where you can see all the amazing architecture and sights from your seat. You don’t have to hurry anywhere or wait for a group, you control the pace and you’re in charge of the route that you take. Ideal for taking pictures. Ever tried taking a photo from a moving bus through the dirty window? Well, if you know what I mean, you will appreciate the freedom a beer bike gives you. Stop wherever you want, stand together for a selfie and enjoy great photos! Eco friendly fun. If you want to protect the poor penguins on their ice blocks, think of the beer bike! It uses no fuel so zero emission is guaranteed. It is you who will save power and spare some pollution for the city. The penguins will thank you for it. It’s cheap. Compared to the price of a regular sightseeing tour, plus the pints that you and your mates consume, it really costs nothing. 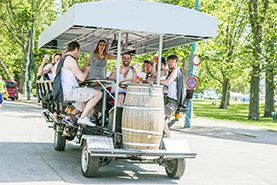 As you can see, there are plenty of reasons to try beer bikes in Budapest, so don’t hesitate and book yours today!